The 2018/19 season of the Premier League is already passed its halfway mark and we've seen some brilliant contests so far. The Premier League is undoubtedly the toughest league in the world - and the most entertaining. Five teams battle for the Champions League spots and no contest can guarantee a winner. The EPL has produced some classics over the years and it's been much of the same this season. The Premier League is the most popular league in the world and it has some of the best players in the world playing in it. The competitive nature of the league makes it very watchable and the fans are left awestruck by some moments of pure magic. In this article, we discuss the top three matches in the Premier League this season so far. Claude Puel, the Leicester City manager, came into this match with his side suffering two back-to-back defeats in all competitions and the Leicester boss was under pressure. Wolves came into this match after suffering a loss to Manchester City last time out and were looking to break into the top half of the Premier League table. The hosts got a perfect start when Diogo Jota gave Wolves an early lead in the fourth minute after Moutinho robbed Gray off the ball and whipped in a delightful ball from the right which was met by Jota's head. Wolves went two up after some dreadful defending from Leicester. A corner was whipped in from the left from Moutinho and Ryan Bennett got the better of Harry Maguire in the air to head the ball in from 7 yards out. It was a dreadful half for Leicester and they needed to turn things around. The second half started with a bang after Vardy slipped a wonderful ball to Demarai Gray in the 47th minute, whose direct pace got him away from Saiss and he drilled a superb low finish past Rui Patricio to get Leicester back in it. In the first seven minutes of the second half, the game turned on its head as Harvey Barnes made the score level for the away side through a shot that deflected off Coady into the back of the net. Wolves went back ahead in the 64th minute after Neves picked up the ball in the middle of the pitch and picked out Jota with an exquisite pass and the Portuguese took it brilliantly on his chest before firing it past Schmeichel. The captain of Leicester, Wes Morgan hauled Leicester level and really out of nothing. James Maddison curled a brilliant cross from a set piece and Morgan powered the ball into the back of the net in the 87th minute and everyone thought that Leicester had salvaged a point. But Jota had other ideas as he scored his third on the day in the 93th minute to give the home side all three points after he was found by Jimenez with a brilliant cross from the right. Nuno Espirito Santo, the Wolves manager was then sent off after he charged onto the pitch to celebrate the winning goal with his players. 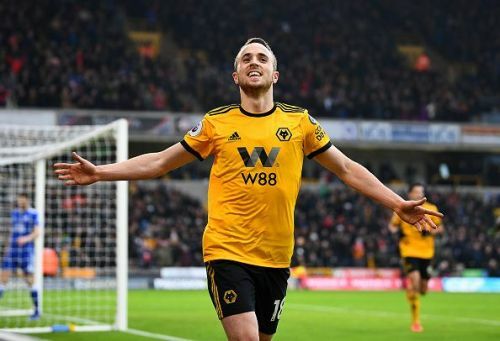 After 90 minutes of a brilliant Premier League contest, the points went to Wolves in the most dramatic style and Diogo Jota was the hero of the match after he scored a match-winning hat-trick. Top 5 in form attackers in the Premier League this season.